This is my oldest gun. I have had it for 28 years. I must say it’s the most accurate gun I own. 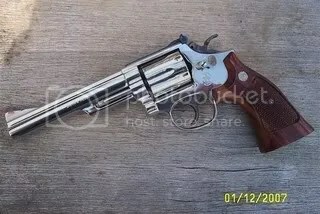 Of course back in the early 1970’s when this was made more hand work went into each gun. Plus, I’ve shot a revolver more than any other gun. The trigger is fantastic and is equal to guns that have been customized these days. This is my favorite gun and will never be sold or traded. I carried it on duty for many years until we went to semi-autos in the late 1980’s. I don’t shoot it as much as I used to but I’ll shoot it probably 400 rounds per year. I could probably shoot it as much as I used to and not hurt it but not wanting to take any chances I’ll go easy on it. 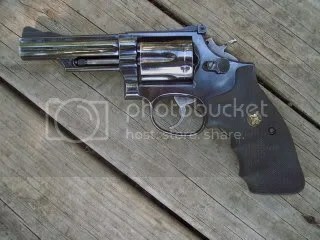 It has the old style pinned barrel with recessed cylinder to encase the entire round. I wish S&W had never changed this feature. It’s not that the new guns are better without it. On the contrary it was a cost cutting measure and nothing more. The same goes for the recessed cylinder. Just a great old gun you can always depend on! Check this beauty out! A good friend of mine owns this nickel model 19. He’s a police officer in Georgia. I would try and talk him out of it but that will never happen:-) It’s an older one that is the kind you never get rid of. 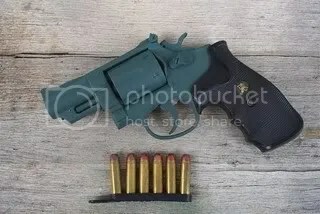 When the great Border Patrol officer Bill Jordan got S&W to make the model 19 they hit a home run that will always be a very viable defensive gun in spite of all the semi autos dominating the market. The model 19 has great balance and very natural in the way it points. It comes on target from the draw most every time. For those that believe in some of the old tactics you can draw from the hip at the three yard line and shoot from the hip and nail the ten ring with ease. As far as the 357 goes it has a 97% plus one shot stop rating which no other handgun tops in any caliber. That’s shooting the 125 grain JHP. If you ever get a chance at a model 19 especially an older one grab it you just can’t go wrong with this gun! Before and after photo of a 2 1/2 inch model 19 refinished in DuraCoat. If you love the Model 19 or are just curious to learn more about them this is the book to get. 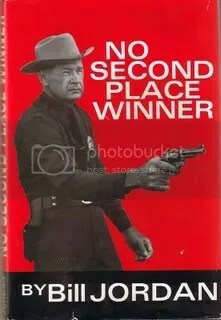 Written by Bill Jordan it is out of print but some searching should find you one. 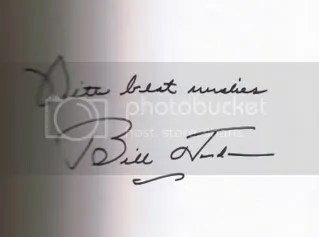 Finding one that’s autographed will be very hard. I got my copy back in 1980. It covers information on gunfighting of course and a few encounters he had. 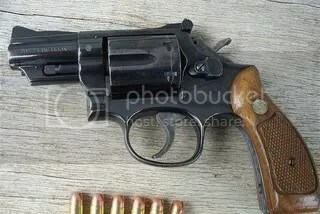 There is also information on how the model 19 came about because of his work with S&W. Notice how huge his hands are holding his model 19! This book also gives you some insight into Bill Jordan himself. It’s a very interesting read.